The local market couldn’t replicate the strength seen in the US overnight. There was a switch out of growth names today into more defensives as resources and financials were hit but money was seen moving into telcos and, utilities and REITs. Asian markets were also trading lower as we closed this afternoon. The biggest news out today was Scott Morrison calling the election for 18 May. 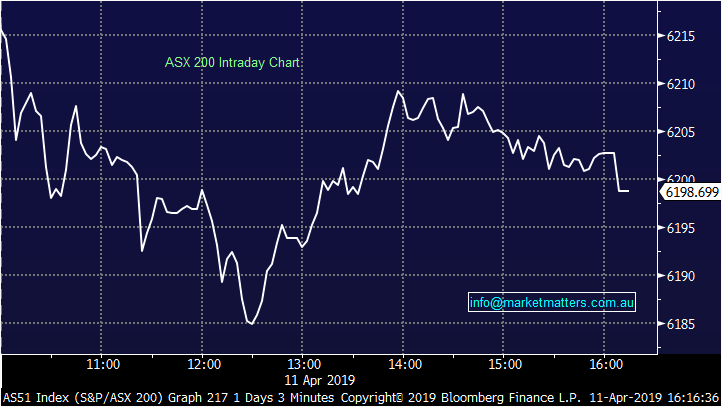 The market looks to have priced in a Labor win here, and although I wouldn’t be betting against that at this stage, the market has a poor track record of predicting voting outcomes of late. 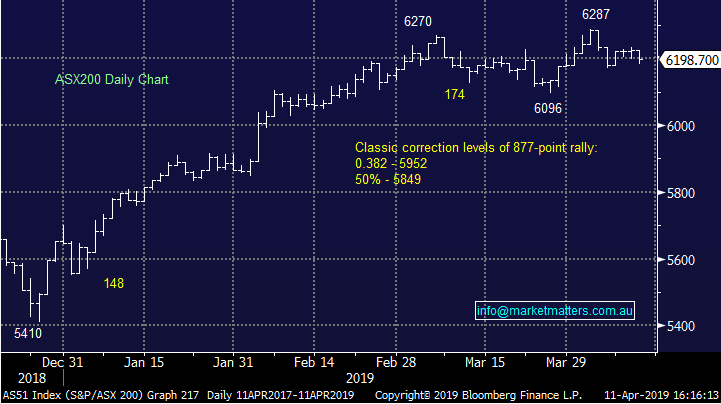 A few minor pieces of news on the stock level today. Rio Tinto held their AGM in London overnight, and the major shareholder made it clear it doesn’t want to see further buybacks as it would raise their holding over 15%. Expect the company to use special dividends if the cash balance blows out. Zip co (Z1P) set a new all-time high close today at $2.15. 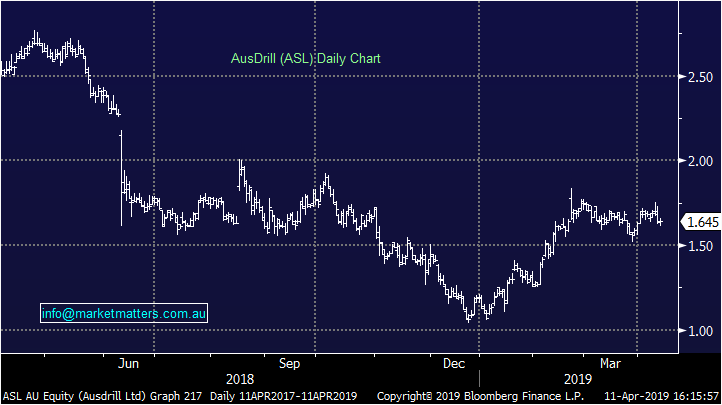 Bank of Queensland (BOQ) posted a soft first half while Ausdrill sold some assets – more on these two below. 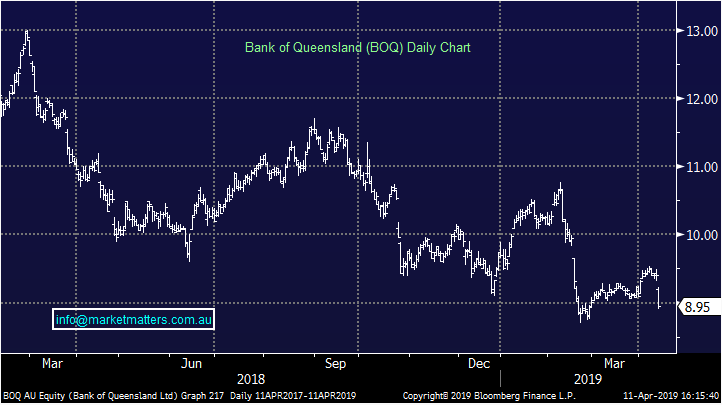 Bank of Queensland (QLD), -4.89%, was sold off today on a soft 1st half report from the company posted prior to the market open. The regional bank saw profit slip 10% from the same period in 2018, despite growing the loan book by 3%. The net interest margin (NIM) fell 4bps over the 6 months to an extremely tight 1.94% due to rising funding costs and increasing competition. Although they still remain at low levels, bad debts did start to creep higher in the quarter – an area which has helped support bank earnings over the past few years.